I will be retiring from EasyCare as of December 31, 2017 with 16 years, 6 months and 6 days of the most incredible journey in this equine industry that one could ask for in life! I am blessed….for sure!! My equine journey of love began when I was just a youngster. My best pals growing up in northern Wisconsin were farm kids that I went to school with. They had horses! Every year going to the county fair, my folks could park me with the ring ponies and they could go enjoy the fair with friends and family as they knew, "Nancy will not leave those ponies and we do not have to worry about her!" Saturday mornings, I would watch all the westerns on the TV. This was the mid 1950’s, so you could find me watching Gungmoke, The Roy Rogers Show, Fury, My Friend Flicka, Sky King, etc. Once again, my parents knew where I was and did not worry. I always told my mother, "I am going to go west and be involved with horses when I grow up”. So I did just that in 1972… on to Arizona in a car, not horseback or covered wagon like I would have totally enjoyed! Life takes us all on various journey’s throughout our years and after many years of different career choices. My life long dream was to work for an equine business. Well, when you put your dreams out to the universe so many times, she answers back and connects you with something so great that you need to pinch yourself to make sure you are still awake! In 2001, my good friend, Nina Knight, told me to check out a position opening at EasyCare Inc, the home of the Easyboot right here in Tucson. So I heard about our County Line Riders Club having a hoof boot presentation featuring Garrett Ford, owner of EasyCare and I knew I needed to go to this. After the presentation, I went over to him, introduced myself and said, “Hi Mr. Ford, my name is Nancy Fredrick and I would like to put my application in with your company and work for you.” He said, "Put the application in and we will look at it.” The universe was at work and I became part of the team. At my desk hard at work. I started in customer service and used my knowledge and talents to eventually become the Office Manager for EasyCare. I wanted to take on all that I could to learn this business and give it my all. At this time, we only had the Easyboot and the Medicator boot. 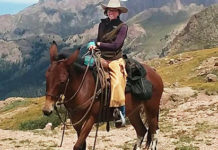 We also had several items for the sport of endurance riding. 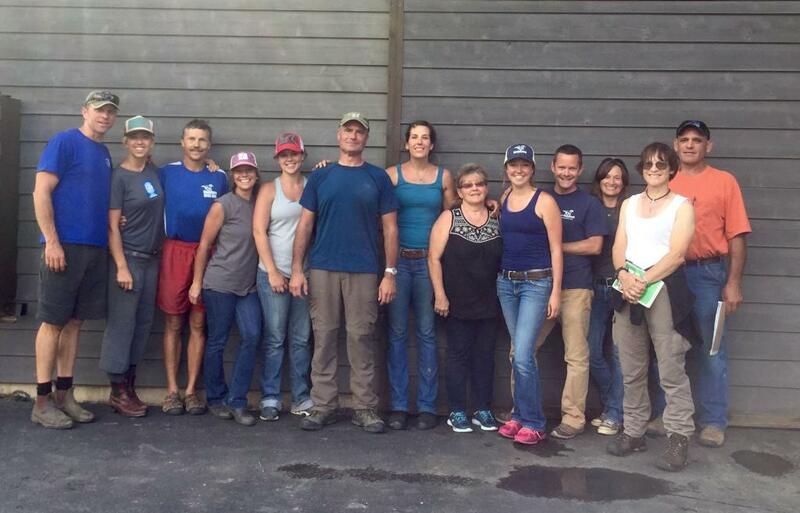 I felt like a kid in a candy store with all of this equine “stuff” and knew I would become a sponge and learn about it all so I could share that knowledge with every customer I came in contact with. As the new boot styles and product that Garrett created came to life, I was so impressed and knew this is where I wanted to be. 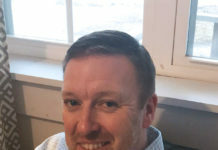 His love of equines and creating products to make equine lives better has been so inspirational and is very infectious to anyone who has a connection to EasyCare. More learning in Durango at the research ranch. From the very beginning of my EasyCare life, I have been inspired and learned more about equine hooves and different products than I ever thought was possible. To work for and be associated with the world leader of hoof boot technology is so mind blowing. This has made me smile every day and be excited about coming to my job each day to give more than 100 percent. 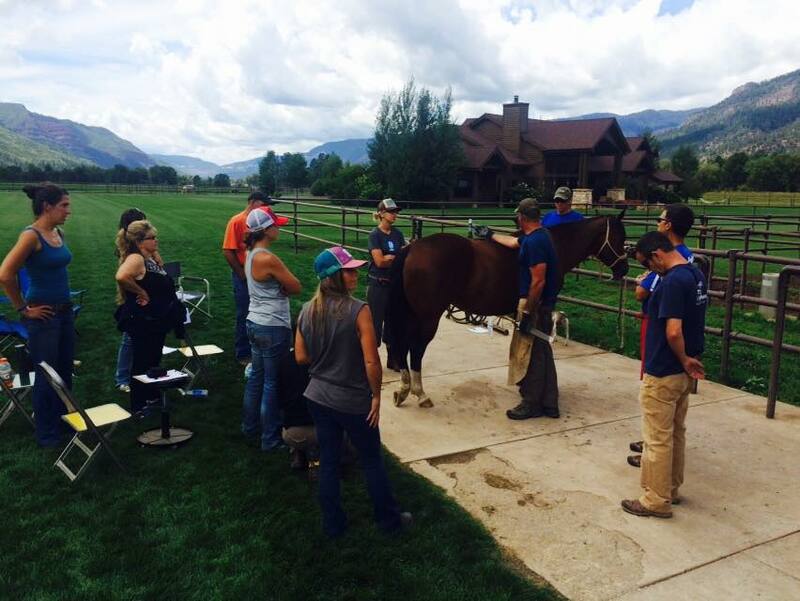 Private clinic in Durango for the EasyCare peeps. Throughout my time here, I have been very blessed to have met and become great friends with some dynamic people in this industry, met and helped awesome customers, worked with really great fellow team members, gone to equine events, put on events to promote our product, and helped to get great businesses connected with EasyCare to help us be better at our jobs. I have learned so many things to better myself and be able to perform my duties with the best interest of EasyCare in mind. I am sad to leave, but it is time to journey on to my next chapter in life. I am forever thankful and grateul to Garrett for taking the chance on hiring me and trusting me with everything EasyCare. I have always told him with much gusto, ”I fight de bull for you, Boss”, and I mean this with all my heart and soul. You have made a difference in my life’s journey with my passion…horses. And to my EasyCare family, I will always be connected with all of you. I am one of your HCP dealers now and will promote all things equine that you put out there. I also want to do hoof boot fittings in my little business to help teach horse owners that boots are great and horses deserve the best from all of us. 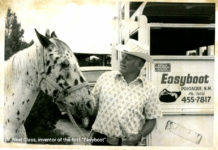 I use EasyCare products for my horses and will continue because I believe in them completely. I send humble thanks and love to each and everyone that I have been blessed to cross paths with in this equine journey…..Happy trails. 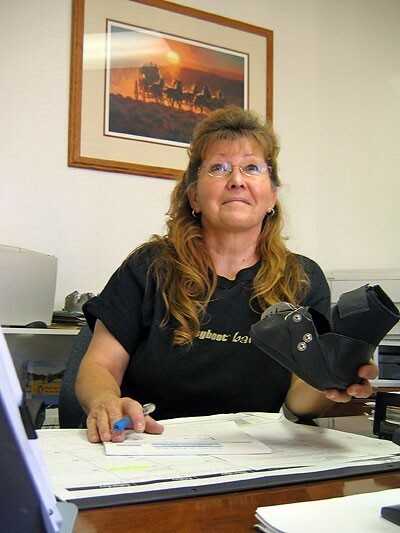 I have been on the EasyCare team since 2001, have been the Office Manager and done everything from A to Z. I have first hand product knowledge as my horses are barefoot, booted and I do their trimming. I can assist you with all of your booting needs. .
Next articleEasyboot Original Equals Endless Possibilities!